Thematic continuity must be served, and so before we push this transit conceit to the breaking point we may as well redirect our squinty, subterranean gaze from Paris way east to New York’s subway system, 468 stops worth of data yearning to be crunched. The stops are columned beneath the city borough name in which they’re positioned (four boroughs in this case; Staten Island has no subways), and those names are problematic; they occupy rows otherwise properly devoted to actual records, and their Otherness compromises the data. In short, borough name rows need to be deleted – at least eventually. What exactly is this formula doing? It’s premised on the notion that any cell in what was the original A column that houses a borough name records no other data across its associated columns, or as operationalized more specifically in the above expression, there’s nothing in the C column. If that be the case, then the entry in B is returned – that is, the borough name. If the condition isn’t satisfied – that is, if the relevant C cell does contain some value – the cell references the contents immediately above it – the current borough name in force. Thus only when a new borough name appears down the B column does the formula introduce a correspondingly new name. Then run the results through a copy> paste values routine, and then delete rows 2, 71, 229, and 348 – the ones containing the borough names. Getting back to our spreadsheet proper, our interest then is in some way assembling a similar lines-per-stop total – by somehow counting the number of times in which the word “icon” figures in each stop record. We see, for example, that the 149 St-Grand Concourse entry features “icon” three times, befitting the three lines sharing that stop. It’s raining outside. When it’s raining I get wet. 1. Substitute every instance of the word “icon” with “iconx”. 2. Subtract the length of that result from the length of the original station expression. 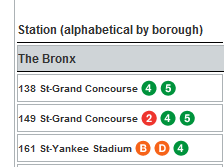 Thus if the word icon appears twice in a cell, thus signifying two subway lines boring through the stop, substituting every “icon” with “iconx” will found a new expression that’s two characters longer than the original – attesting to two lines. Then copy the above down the C column. And once that mission is accomplished, you can shift into data analysis mode.